Sleep plays such an important role during the childhood development years. It can affect mood, motor learning, sensory processing, weight gain and more. When parents provide a predictable sleep routine each night, children can get the 9-12 hours of recommended sleep per night (depending on age) for overall health. 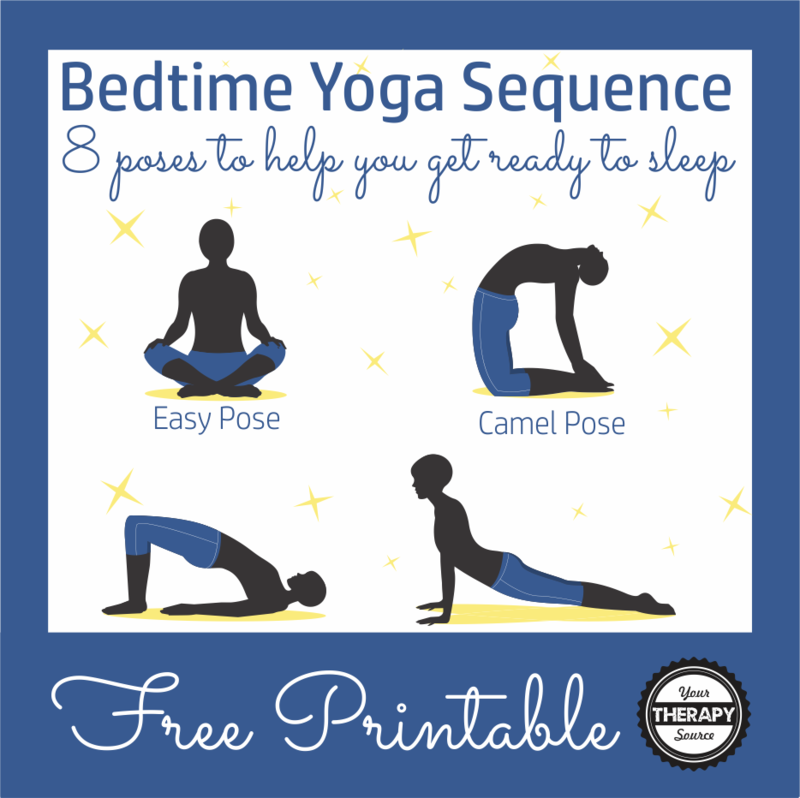 This bedtime yoga sequence can help to create a calming atmosphere during the evening. 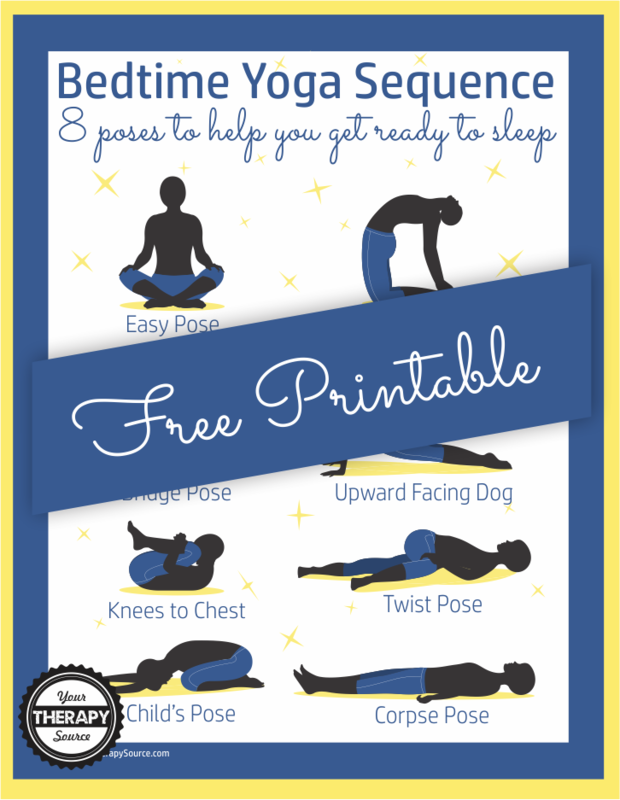 You can download the free printable for the bedtime yoga sequence at the end of the post. Limit vigorous physical activity before bed creating a calming atmosphere. Begin to calm a child down before bed with this bedtime yoga sequence to help the transition to sleep time. Turn off the television/computer/tablet/phone at least 30 minutes before bed. Establish a routine in the evening – bedtime yoga sequence, brush teeth, read for 20 minutes and go to bed. Try to stick with the routine especially with regular bedtimes and morning wake up times. When you are starting to wind down for the evening, lay out a yoga mat or beach towel on the floor. Move through the following yoga poses spending about 30 seconds to 1 minute on each pose depend upon the child’s age and attention span. Sign up to receive the weekly Your Therapy Source email newsletter and other announcements. A new tab will open with your PDF copy of the Bedtime Yoga Sequence. Why Is Yoga Beneficial for Children? 1. Yoga increases physical activity. It is recommended that children participate in at least 60 minutes of physical activity every day. Yoga is an excellent choice since it can be performed indoors or outdoors and in small spaces. 2. Yoga teaches children to relax. Children’s schedules are super busy – school, extra curricular activities, sports, etc. Today’s children need to reduce stress with relaxation techniques. 3. Yoga is for all children. Yoga can be modified to be completed by all children including those with physical disabilities making yoga a great choice for an inclusion activity. 4. Yoga helps children to control their emotions. Deep breathing exercises can help children to reduce anxiety and calm down in stressful situations. 5. Yoga helps with self regulation skills. Children learn how to respond to and control their body. 6. Yoga improves muscle strength and flexibility. Growing up today in this sedentary, technology filled world takes a toll on an individual’s body. Children will need to work hard to maintain a healthy body. When children maintain good flexibility and muscle strength they can prevent injuries during sporting activities. 7. Yoga can help to improve attention span and focus. Children need to concentrate during yoga poses which in turn can help them to increase their attention span and focus. 8. Yoga helps children develop balance and coordination skills. Coordinating the movements of yoga poses combined with balance skills on one foot, knees or upside down can be challenging. 9. Yoga improves posture. Children spend so much time sitting at their school desks, leaning over a keyboard or hunched over a cell phone. Yoga poses can help to improve spinal alignment and posture. 10. Yoga helps children develop listening skills. Children have to listen to the directions how to move their body including right and left directionality. Get started today and teach children to do yoga! Want to Improve Motor Learning? Go to Sleep. 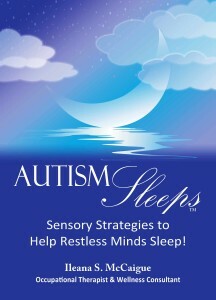 Get more sensory strategies to help restless minds sleep in Autism Sleeps™. This is a thorough resource of sleep sensory strategies and suggestions for preparing the “sleep environment”. Sample bedtime and wake-up routines are provided as templates, especially to guide parents of children with sleep difficulties. Also includes checklists to identify which of the six sensory area(s) are impacted by poor sleep. A menu of sensory strategies in each of those affected areas is available for use in preparing a person to sleep, stay asleep and transition to wake up. Additionally, a diary and graph are available for logging the impact of the strategies implemented to determine those that are most effective in helping restless minds sleep. FIND OUT MORE.